Liverpool’s past potentially met Liverpool’s future last night in the Champions League, and it was Fernando Torres who came out on top, albeit very briefly. 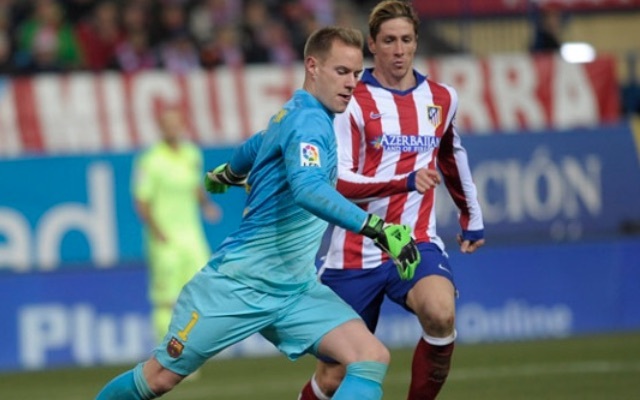 The ex-Reds striker gave his Atletico Madrid side a 1-0 lead over Barcelona in the first leg of their quarter-final tie by nutmegging goalkeeper Marc-Andre ter Stegen. Ter Stegen has been linked with a transfer to Anfield by The Express as Jurgen Klopp explores bringing in some competition for inconsistent number one Simon Mignolet. This Torres goal proved that the German is not perfect himself, but another former Liverpool hero came to his aid to secure Barcelona a narrow 2-1 win at the Camp Nou. After Torres had been sent off for a silly second booking, as you can see in the above video, Luis Suarez scored twice to take his tally for the season to a phenomenal 45 goals.